Stunning blood-red sepals of Mussaenda erythrophylla! Wow! What a stunning beauty! Just look at that vibrant red flower clusters, how fabulously attractive they are…a sight for sore eyes, a cheerleader and definitely a traffic stopper! 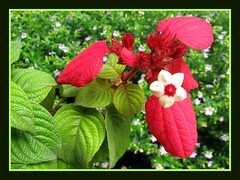 Common Name: Ashanti Blood, Red Flag Bush, Red Mussaenda, Prophet’s Tears, Tropical Dogwood, Virgin Tree. Plant type: Tropical shrub or tree native to tropical West Africa. Moisture: Needs moderate water regularly but do not overwater. It must be watered during spells of hot and dry weather as it is not drought tolerant. Features: An ornamental shrub or tree that can reach a height of 30 ft, though in cultivation ranges from 3 to 10 feet tall. A semi-deciduous rambling shrub with multiple stems, covered with opposite leaves that are medium to dark green, round to ovate, 3-6 inches long, pubescent and strongly veined. It flowers almost non-stop through the year with several flowers borne in branching terminal panicles. Each flower is composed of a small creamish white corolla that is five-lobed (0.8 inch across), funnel-shaped with a crimson-red felt center and pubescent beneath, together with a single roundish-ovate and enlarged bright red sepal (bract) measuring 2-5 inches. It is these stunning blood red sepals that led it to be commonly named ‘Ashanti Blood’ or ‘Red Flag Bush’. This very attractive cultivar, Mussaenda erythrophylla, together with Mussaenda philippica ‘Aurorae’ are the proud parents of the horticultural hybrid, Mussaenda ‘Queen Sirikit’, that was developed in the Philippines and has gorgeous pale pink sepals and is one of the most spectacular of mussaendas. Usage: Since Red Mussaenda is a year-round performer, it is most ideal as an ornamental plant in parks and public gardens or along roadsides, streets, byways and highways. Great for landscapping as a single decorative specimen or amidst a crowd of low-growing plants in a border. 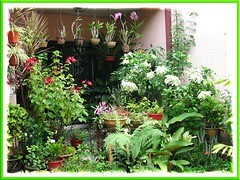 It would fit beautifully in home gardens too, either in containers or ground. Attractive to butterflies, bees, hummingbirds and insect pollinators as a nectar plant. Care: Mussaenda ‘Ashanti Blood’ loves hot and humid environment, so locate it where it can receive full sun to induce best flower color and continuous flowering. Prune after blooming to shape and get a bushier shrub with more branching, resulting in more flowers. It has a tendency to become straggly and leggy, so prune heavily which it can tolerate, if necessary. There are no known serious insect or disease problems but do watch for spider mites and whiteflies. More recent images of Mussaenda ‘Ashanti Blood’ from our garden! We wish to buy th mussaenda erythrophylla. Can you help us find a supplier? Hello Donald! You may want to try at TopTropical Botanical Garden in Florida. It has a fantastic collection of tropical plants, though I’m not sure whether Mussaenda ‘Ashanti Blood’ is available. Explore their awesome website for more information and direction here! 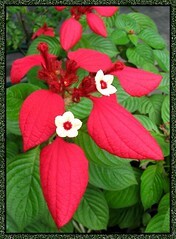 You can order red mussaenda at almostedenplants.com. I already ordered mines today. Hi, I have a Mussaenda in my front yard but the leaves have turned yellow and it’s straggly, should I prune it, and if so how much? also the yellowing leaves is a nutrient deficiency? I’d appreciate help with this plat as it’s one of my mother’s favorites. You say that this plant can range to 30 ft high, but in cultivation it ranges from 3-10 ft. As I am a novice gardener I am not quite sure what “in cultivation” means, but I am interested in limiting the height to a max of 10 ft (more ideally 8 ft). How do I accomplish this? A friend told me that plants will not grow too tall if they are not fertilized too frequently, but I want to take full advantage of this plants beautiful flowers and fear that infrequent fertilization will affect that characteristic. If allowed to grow unhindered especially in the wild, it can be very tall. But when grown in home gardens or parks where it is properly tendered and PRUNED REGULARLY, one can maintain a much lower height according to one’s preference. Feeding it once monthly is ideal. Nonetheless, it is a fast grower with lanky stems and the only way to limit its height is to trim it hard frequently after flowering. I hope viewers can see pictures of your mussaenda too. Thank you so much, Autumn Belle! Hope to visit you shortly, I’m convinced you have a lovely article with beautiful pics on Mussaenda ‘Queen Sirikit’ to enjoy. Re family name, it is Rubiaceae as confirmed at The Plant List and many other trustworthy botanical sites.